The V7 combination security lock is designed for technology products that have a security lock slot and fits practically all notebook computers manufactured today. 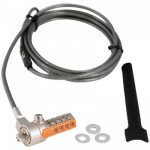 The security lock provides a simple and effective way to secure notebooks, desktops, monitors and projectors. The push-to-lock function and 90 degree cable design insures easy operation. The lock head tumbler swivels and rotates making it easy to read the numbers when setting the up to 10,000 unique combinations.